Read here about tensegrity structures composed of twenty-one struts, part of a series of pages organized by strut count. A 21 strut tensegrity with a computer-driven air compressor, pneumatic valves and human-activity-tuned sensors was deployed by Yosuke Ushigome, a masters student in Informational Science and Technology at the University of Tokyo. He named it Archi/e Machina. In his words, it is a large tensegrity-based structure with sensors that activate changing tension members in its tendon net. The hardware of Archi/e Machina can be divided into a sensing device and a spatial structure. The sensing device in the prototypes were either microphones or six infrared sensors. 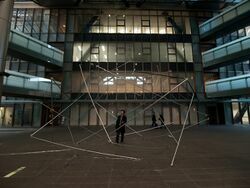 The spatial structure, based on tensegrity, was composed of aluminum pipe and steel wire. Pneumatic devices were used to dynamically modify the structure. Its software consists of PC programs such as Max/MSP patches, that can input the sensor data and actuate the pneumatic devices. 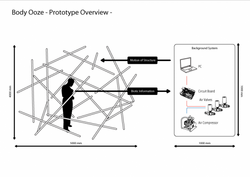 The size of one prototype was 5m x 5m x 4m (WxDxH) for spatial structure and 1m x 1m x 1m for its background system. 21 strut dynamic body ooze by Ushigome. Body Ooze schematic rendering byUshigome. This page was last edited on 23 September 2018, at 12:26.